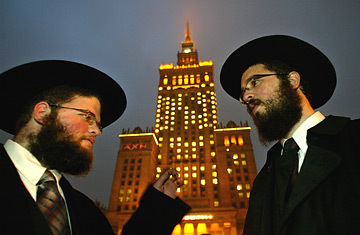 Orthodox Jews prepare to light a menorah in front of the Palace of Culture in Warsaw, Poland. Book launches for works of history are typically sedate, often even boring affairs, but the shouts of "Lie!" and "Slander!" from the agitated crowd suggest that the latest offering from Jan Tomasz Gross is garnering attention in circles way beyond those of academic historians. Gross has come to Warsaw's Entrepreneurship and Management Academy to promote his new book, Fear: Anti-Semitism in Poland after Auschwitz, and the visible police presence and the plethora of TV cameras in the jam-packed hall make clear that the topic has aroused strong emotions. Gross, a U.S. historian born and educated in Poland became internationally famous for his 2001 book Neighbors, chronicling the massacre of Jews in the village of Jedwabne during the Nazi occupation. That book stoked controversy in Poland because it demonstrated that the Jews of Jedwabne had been brutally murdered not by the Germans, but by local Poles. Fear, published in English in 2006 but first released in Polish just two weeks ago, takes a wider look at post-war anti-Semitism in Poland, investigating why Jews returning to their homes having survived Nazi atrocities were terrorized and sometimes murdered by Poles. Needless to say, it is not a topic with which Poland has been comfortable in dealing. Poland, which lost about 6 million of its citizens in the war  half of them Jewish  prides itself on being the only country in Nazi-occupied Europe that did not have a collaborator government. But Gross suggests that being a direct witness to Nazi atrocities  Jews from all over Europe were herded to concentration camps in Poland  unleashed a brutal anti-semitism in the country that had for almost nine centuries been home to one of Europe's largest Jewish communities. Gross provides extensive evidence of how many Poles chased away or killed Jewish Holocaust survivors, often out of fear that returning Jews would reclaim their property that had, during the occupation, been taken over by other Poles. At Entrepreneurship and Management Academy event, Gross recounted his amazement at reading the memoir of a Jewish activist traveling across post-war Poland seeking Jewish children hidden from the Nazis by Poles. "Those people who had heroically saved an innocent Jewish child begged not to have their names revealed out of fear that their social circle would find out," said Gross. "I did not understand that, and in this book I have attempted to answer that question." His conclusions are harsh: "A very brutal anti-semitism was widespread in Poland," he told his audience. "Many Poles agreed with the opinion that Hitler should have a monument elevated for helping Poland solve the Jewish question. That was happening not in only Poland, but in all of post-war Europe." Many leading Polish public figures have criticized the book, saying that Gross neglected to take into account the context of of a shattered and demoralized post-war Poland suffering the the brutal imposition of the Soviet system. The victims of the turbulent postwar years were not only Jews, but also anti-communist Poles as well as Ukrainians and Germans expelled after the post-war shifting of borders. "Let�s remind ourselves of what was going on in New Orleans after a few days of a hurricane," historian Marcin Zaremba wrote in the Polityka weekly. "In Poland, the 'hurricane' took place for five years, or even longer." Gross even has his critics among Polish Jews. At the Warsaw event, Feliks Tych, longtime head of the city's Jewish Historical Institute, criticized Gross for telling only part of the story, selecting the facts that suited his thesis about deeply-ingrained anti-semitism while forgetting to take into account the post-war collapse of state institutions and social control. "Gross is too much of a judge in his book but too little of an analyst," said Tych. "But after his book, it is no longer possible to escape from the question why there were killings of Jews after the war, and that is is his undeniable achievement." Poland's Catholic Church, blamed by Gross for doing nothing to stem the wave of post-war anti-Semitism, has lashed out at the book. The Krakow archbishop and close associate of the late Pope John Paul II, Stanislaw Dziwisz, has written a letter to the Catholic ZNAK publishing house, saying that it should not have published the book. A publishing house should "propagate historical truth," not "awake anti-Polish and anti-Semitic demons," said the archbishop. Polish prosecutors are considering charging Gross with slandering the Polish nation. Gross, a Princeton professor who left Poland in 1969, having been expelled from college the previous year during an anti-Semitic purge of 1968 student dissidents, has returned to confront the country of his birth with some uncomfortable truths. Early in the proceedings, about a dozen young people demonstratively left the room shouting "Shame!" and "Enough with slandering Poland!" Gross remained calm and quiet. "I speak about things that have been known but have not yet been put in such a clear, sharp and unambiguous way," he said. "It's difficult because we are talking about the time that has shaped our identity, who we think we are." Still, the fact that there was as much applause as booing from the crowd at the Entrepreneurship and Management Academy suggests that there are many in Poland ready for a more honest accounting of the past.